I pulled out of the Kentucky Horse Park after our first combined test of the spring season with a nagging hole in the bottom of my stomach. A former jockey once told me that really analytical riders don’t necessarily make the best jockeys. As with any athlete, someone who’s really successful in the starting gates must have the ability to make mistakes or even hit the ground at 35 miles per hour and get back on tomorrow without holding on to yesterday’s disappointments. I have never been good at this, and I had the feeling that the weekend’s rides were going to stick with me, the worst parts of them replaying in my head for weeks to come. Neither our dressage test nor our stadium round was our worst; we had small moments where we fixed things that had challenged us in the past. They weren’t our best either, given how well and how hard we’d been practicing at home in the weeks before. 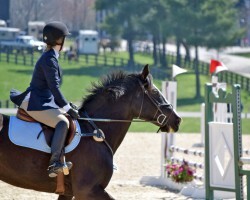 Dressage scores across our division were quite high, so I wasn’t surprised when we got slapped with a tough score. But of course, I wasn’t going to do that. Instead, I went home and watched video of a friend’s test. She had scored a 20, and I could see why. Her horse was supple, smooth, consistent in her capable, well-trained hands. I was pretty sure we wouldn’t ever look like that, but I knew we could have gotten closer if only I had added more leg here, more inside rein there. I don’t often miss the hunter ring, but at times like this I do wish I could enter a second class and get another run at a test or course that fell short. I can deal with putting in a lousy ride because of fear. I’ve dealt with some combination of stage fright and terror of jumping for a long time now. I had such visions of devouring the stadium course, of floating in dressage (at least for a few seconds). This, I’d silently hoped, might be the show that we “put it all together.” Photographic records of the event might finally show hints of the leg and hand positions I’ve been studying from Denny Emerson’s many writings on proper equitation. Then I remembered—I’m a writer. I could call him and ask him. So I did. It sounds so simple, but I’ve realized the key is to set reasonable goals, not just for your career as a rider, but for smaller things like a horse show or a lesson. Part of what constitutes a “reasonable” goal, Emerson told me, is what the horse will tolerate—you have to have a horse who won’t be so stressed by the learning process that they revolt. You also have to recognize whether you have a trainer who can explain things in a way that they will “click” and allow you to reach those goals. And, perhaps most importantly, don’t overdo it. Our next combined test is in a few weeks and I think I’m going to make our goals a lot simpler: forward trot in dressage, and more forward jumps than sleepy ones. I think we can manage that.